Firestone has a variety of tires for your truck, car or SUV to take on any highway, backroad or trail. Select your wheel size below to explore a wide selection of Firestone tires for your vehicle and driving conditions. Determining the correct tire size for your vehicle is fairly simple. Find your size by checking the owner's manual, tire sidewalls, driver's side door jamb or inside your glove box door. The tire size information will start with a letter, either "P"or "LT", which stands for passenger or light truck. The first number after that confirms the width of the tire with the second representing the aspect ratio, or the tire's height as a percentage of the width. The following letter indicates the construction of the tire and then the final number represents the wheel diameter. 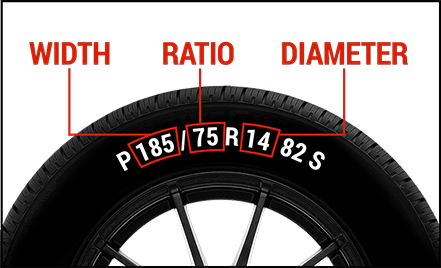 Select your wheel diameter below and then find your tire size to see the full selection of Firestone tires available for your vehicle.